Bronson: Thank you for doing this Richie! Richie Owens: Hey, thank you. Richie Owens: I am from Tennessee. As they say, "born and half raised here". I was born in east Tennessee, in the Smoky Mountain area. Bronson: So when did you come to Nashville? Richie Owens: Well my family was in the music business from before I was ever born. It's generational and because of the music business being here in Nashville my parents moved here when I was a little kid and I've lived here ever since. Bronson: So you were raised here? Richie Owens: Yes I was. Bronson: Man that's one of the rare ones, raised up here. Richie Owens: Yeah I don't know many people that were born here in Tennessee and from Nashville. Bronson: What was your first instrument? Richie Owens: My first instrument was saxophone. Then by the time I was a teenager I got into playing the Dobro guitar because nobody else in my family played that instrument so I jumped on the Dobro. I remember a lot of the older guys, like Bashful Brother Oswald and Josh Graves, were all from east Tennessee as well and I thought that was so cool the way they played the lap guitar so that made me want to play it. Bronson: What all instruments do you play professionally? Richie Owens: I play the Dobro, Guitar of course, Keyboards, Bass, play the Saxaphone, Mandolin, and that's pretty much it. I stay away from the drums (laughing). Bronson: Don't you also build instruments? Richie Owens: Yes I do. I had my own line of guitars called Owens Guitars for many years. I worked with Gibson for a while helping do the Dobro Guitars and eventually left there in the late 90's and went on to produce Dolly Parton's records and doing other stuff, got back into that music, but still had the bug for instrument building and so we started Owens Guitars and built acoustic guitars and resonator guitars. Bronson: So if you had to just pick one instrument, what would be your main instrument? Richie Owens: Oh I grew up, my Dad had recording studios from when I was a kid. He actually built Fireside Studios here in Nashville, one of his first studios back in the early 70's. He was managing Dolly Parton at the time, Porter Wagoner, they were all together. That's when they built Fireside Studios, I think about '72, '73, somewhere in there. Anyway, so I got the studio bug, grew up playing in studios. Love doing that but there's nothing like being out live with my band. I love doing that. Bronson: And your band is? Richie Owens: Richie Owens and the Farm Bureau. Bronson: And you also probably have a myspace? Richie Owens: Yeah, same thing, just type that in there and you'll find us of course, or Facebook, any of that stuff. Bronson: So I'm here right now sitting in your studio with Bil VornDick over there working on the console. What is this project you're doing right now? Richie Owens: Well this project that we're working on now is actually Richie Owens and the Farm Bureau's project. Bil's in here engineering and producing the record. I wanted to take a break from just producing and trying to wear too many hats and be the artist in this situation and we've been friends for a long time. He really likes my music and wanted to get involved with the project and we've got some really great label interest going on right now so we're getting our album finished for some of the label people that are talking to us. Bronson: Well you can't be in better hands then Bil VornDick, that's for sure. Richie Owens: Oh yeah, Bil's great, Bil's awesome. Bronson: We go back all the way to 1984. Met him in John Denny's driveway man, I was living there in my Winnebago (laughing). Richie Owens: Yeah I love Bil and I'm glad I've got him aboard on this thing. It takes a lot of pressure of me. Bronson: So you also mentioned you have a recording project going on right now with Dolly Parton? Richie Owens: Yeah I am producing a project right now. It's called "Family, Something Special", and it is a album and it's also a film documentary on Dolly Parton's family. All the Parton family and the Owen's family and it goes all the way back to the Civil War era. Cold Mountain, the story of the fiddle player that's in Cold Mountain is a true story. That's mine and Dolly's, Great Great Great Grandfather, and that fiddle was passed down to our Grandfather, which is now in the museum at Dollywood. That actual fiddle and that story from Cold Mountain is a true story and it's our family and that's how this filmography starts off. From there it talks about music always being in our families, you know. Everybody in our family, my Grandparents on back have always played music and performed as performers. Bronson: So when is that? Do you have any kind of a time frame yet? Richie Owens: In the Fall. It's going to be a Fall release. Bronson: So do you play up at Dollywood? Richie Owens: I used to. I've actually played there on and off over the years. We're going up there, they're actually honoring everybody in our family. They're having the 25th anniversary of Dollywood this year and they're honoring everybody in the family that performed up there, so I'll be going up there this year for a huge presentation and her Memorial Garden thing that she has and the Friendship Fountain thing that they have up there and they're doing this whole thing on all of our family that's performed up there over the past 25 years. Bronson: That's incredible. Besides that, do you have any shows coming up? Any events you'd like folks to know about? Richie Owens: As far as in town, we usually play 3rd & Lindsley, it's where we normally play. We've got one coming up the 28th of this month. Bronson: Do you have anybody you've always wanted to play with? Is there somebody you always wished you could get on stage with or make a record with, that you haven't yet? Richie Owens: Oh my goodness, that's a toughie. There's guys of course that I'd like to work with. I would love to work with an interesting artist like Tom Waitts just so what I can learn as much as try to bring to the table of what I hear with an artist like that does. You know it don't get any better then have an opportunity to work with someone like Dolly Parton herself. As far as someone to go out and play with, we've always prided ourselves as being a band, in fact my band has backed up Dolly and we've backed up other artists. We've even went out and done some performances with Dolly's sister, Stella. Other artists in the studio like our sound so we've cut several artists just using us as a back up band for them, so we've always liked going out and doing that. As far as an artist, backing up another artist, I'd say probably an artist like Bob Dylan, somebody like that. Just like the Greatful Dead or the Band, or Tom Petty have done and backed him up, I think we would be a good interesting fit for him. Bronson: Having lived here a long time and then also working in town, do you have any advice for anybody that's new to town or been here awhile trying to break into the live or studio playing? Richie Owens: Oh gosh, just hang tough, stay tough. The main thing is don't get disillusioned and don't bite on the first thing that lands on your bait, (laughing) so to speak. You know, 'cause there's a lot of opportunities and eventually you'll weed through the weeds and find where the grass is green. Bronson: So as a guitar player, what kind of strings do you like? Richie Owens: Right now I'm using Dunlop. Dunlop accessories now has strings and they're making some really great strings and I use them and I use GHS. Bronson: So you basically play acoustic or you play both? 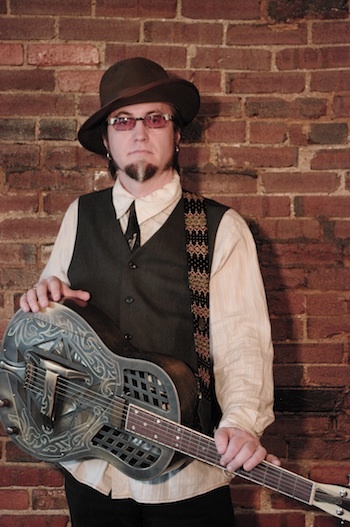 Richie Owens: I play acoustic and electric but you know I'm known for my resonator guitar playing, for playing electric slide guitar. I play the Bluegrass style too but I'm more known for playing the bottleneck style, slide playing. Bronson: Do you have a favorite kind of music? Richie Owens: I like all kinds of music from Blues to Bluegrass, I like it all. Good music is good music. You're gonna find some good music in all kinds of music. Bronson: Duke Ellington, somebody asked him that one time, he said, "Well you got two kinds, you got good and you got bad. I like good music." Bronson: Richie, I really appreciate you doing this man. It's an honor to meet you. Richie Owens: Alright, thank you so much. Bronson: Good luck with everything you've got going. Richie Owens: Alright, I appreciate it.